Everyone loves krispie treats. I mean everyone! Some of you may be like me, somewhat of a closet marshmallow treat lover. You sneak a square when no one is looking. But then some of you may be more like my family. You grab a corner of the marshmallow treats (still in the pan) lift up and tear off a big chunk! No plate or napkin required..Chocolate Mint Krispie Treats are sensational. 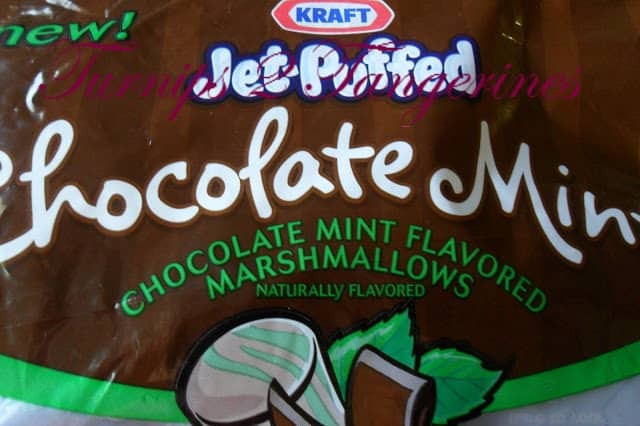 I found Jet-Puffed Chocolate Mint Marshmallows at Target while on a recent trip visiting my daughter in Athens GA. What a tasty find. Not only were the marshmallows light green and brown swirled, they had a delicious aroma. Yes, I smelled the bag!! Chocolate mint treats are made in the same fashion as all marshmallow treats are. Simply mix together chocolate mint marshmallows, chopped chocolate-mint candies and cocoa pebbles cereal and you have a fantastic treat. 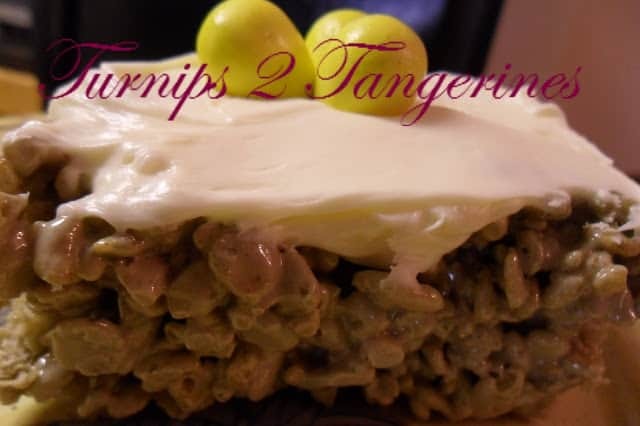 I think I forgot to mention that chocolate mint krispie treats are topped with a can of vanilla frosting that has 1/2 teaspoon peppermint extract added. Frosting the marshmallow treats with a canned frosting is super but the addition of that small amount of peppermint extract takes them into the WOW zone! What’s a WOW zone? Adding something extra special to a recipe that takes it from so-so to WOW! Chocolate mint krispie treats are super! Melt butter in large saucepan. Add marshmallows and stir until marshmallows are melted, add coarsely chopped candies and stir until candies are just starting to melt. Add cocoa rice cereal r and stir until well coated. Transfer to a buttered 13 x 9 baking dish. Using a buttered spatula press mixture into dish. Set aside. In a medium bowl, mix together mint extract and vanilla frosting. Stir until combined. German Chocolate Cake Crispy Treats is another marshmallow treat recipe you and your family will love. 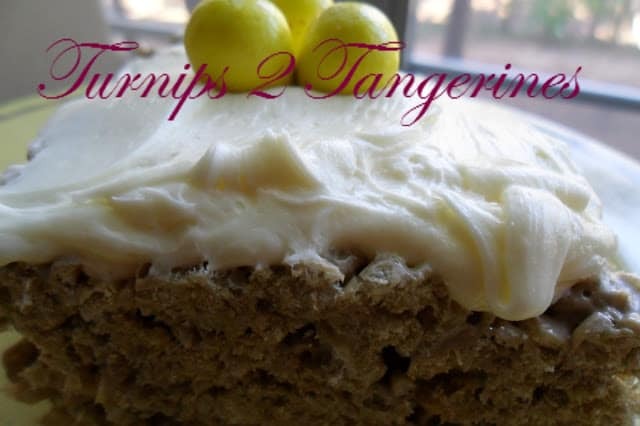 Here on Turnips 2 Tangerines we have many recipes for marshmallow treats. To find more recipes for marshmallow treats check out our Recipe Box. 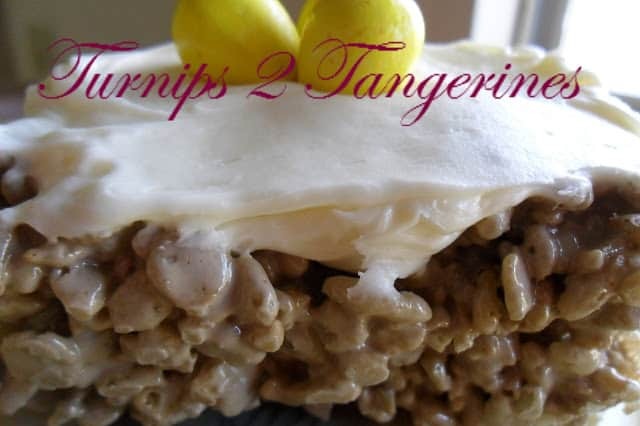 This recipe is made using: Kraft, Post and Andes Mints products. I didn't know that you can buy chocolate mint marshmallows.I have to look for these. They look great. Oooooh, this looks dangerous! It has all my fave tastes-crunchy and choco-minty! Yummy, and more yummier cause of the Chocolate Mint.